I was inspired by the pretty colours in our inspiration this time so I began by sponging using some distress inks onto a white card panel. Then I stamped and die cut the pumpkins from the panel. I had a bit of a go at getting a photo that really captured the inking as it appears in real life. Well the missing box of Stampin' Up inks, some NBUS Papertrey Ink stamp sets and my light tent appears to be the ONLY box that did not arrive to the new house in the move. My hubby went through every single remaining box last weekend and then a second time with me to make sure and still not there. He took it much better than I did even after I told him how much it would cost to replace. He is too easy going for his own good, but I'll keep him. Really the inks that I am the saddest about are the retired colours that I was able to find and purchase on eBay. 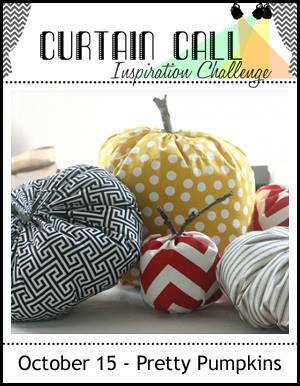 I hope you pop over to the Curtain Call and see what the rest of the team has come up with this time and to meet our two newest Design Team members--Leigh Penner and Lori Tecler. So CAS and lovely, Tracey ... hint on that box: look under beds, and in all closets! of course, a little conversation with St. Anthony couldn't hurt - He's helped me out so many times!! Well this looks familiar and even better now that it's all done! Love your CAS approach to this challenge. Tracey, I love your style!! And oh so sad to hear about the missing box of treasures! I adore your new neighborhood!! Talk about being in God's country! Blessings and hugs! Love your sweet little pumpkins on this card. And, I am so sorry to hear about your missing box--which looks like it will remain missing. I can't imagine how sas you must be. You are lucky to have such a sweet hubby, and I hope you have fun shopping for all the replacement stuff. Wonderful colors on your sweet pumpkins! Tracey, I am so sorry to hear about the lost box, and especially the retired inks! Our crafting tools and supplies are valuable in ways other people would never understand. I'm so glad your husband cares! Sweet, simple fall card! Love it! Your trio of pumpkins is darling :) Love that colour combo. Darn on the box :( Can you check with the moving company to see if it showed up somewhere else? Have you tried SCS's Buy or Sell page to see if anyone is selling some of the colours you want? I have picked up a few sets I wanted that were retired there. cute pumpkins. Love the fresh, clean feeling of this. I am completely smitten with these pumpkins, love their shape!! Cute card Tracey! Well that really stinks that your box is nowhere to be found. I would search every nook and cranny again just to ease my mind!! Any chance it ended up at college with your kids LOL!! Your card is gorgeous - love those beautifully inked pumpkins! Love the colors of your wonderful pumpkins--so fall! Sorry about the missing box. I would feel awful too. Your hubby is so sweet and helpful. Maybe you should post a list of the Stampin' Up colors in case someone out in blogland has some. Beautiful CAS card with the pumpkins! So sorry to hear about the missing box, especially the inks! I do so hope that they turn up soon! And, how awesome that you have a sweet thoughtful husband! Your little pumpkins: darling! I agree with Michele: St. Anthony is amazing! I'll ask him, too! Darling card and perfect take on the challenge. Your trio of wee pumpkins is about as cute as can be! I love those gorgeous, rich colors you use. I hope you find your inks at some point, can't imagine losing so many at once. I'm sad about your missing inks too. :( Hopefully you can replace the ones that you really need. Oh, and this is a fantastic CAS card. I love the pumpkins in these colors! Such a sweet card Tracey. Love the fall colors. This is such a sweet take on the challenge, Tracey! I love your trio of pumpkins and the color combo is amazing! So sorry to hear about your missing inks...I sure hope you will find a way to replace them...Crossing my fingers for a good outcome for you! Great take on the inspiration photo! These _are_ pretty pumpkins! The subtle shading is perfect.